This article covers the political aspects of the American Revolution. For the military campaign and notable battles, see American Revolutionary War. The American Revolution refers to the period during the last half of the eighteenth century in which the Thirteen Colonies that became the United States of America gained independence from the British Empire. In this period, the colonies rebelled against Britain and entered into the American Revolutionary War, also referred to (especially in Britain) as the American War of Independence, between 1775 and 1783. This culminated in the American Declaration of Independence in 1776, and victory on the battlefield in 1781. France played a key role in aiding the new nation with money and munitions, organizing a coalition against Britain, and sending an army and a fleet that played a decisive role at the battle that effectively ended the war at Yorktown. The revolution included a series of broad intellectual and social shifts that occurred in early American society, such as the new republican ideals that took hold in the American population. In some states sharp political debates broke out over the role of democracy in government. The American shift to republicanism, as well as the gradually expanding democracy, caused an upheaval of the traditional social hierarchy, and created the ethic that formed the core of American political values. The revolutionary era began in 1763, when the military threat to the colonies from France ended. Adopting the view that the colonies should pay a substantial portion of the costs of defending them, Britain imposed a series of taxes that proved highly unpopular and that, by virtue of a lack of elected representation in the governing British Parliament, many colonists considered to be illegal. After protests in Boston the British sent combat troops. The Americans mobilized their militia, and fighting broke out in 1775. Loyalists composed about 15-20 percent of the population. Throughout the war the Patriots generally controlled 80-90 percent of the territory, as the British could only hold a few coastal cities. In 1776, representatives of the 13 colonies voted unanimously to adopt a Declaration of Independence, by which they established the United States of America. The Americans formed an alliance with France in 1778 that evened the military and naval strengths. Two main British armies were captured at Saratoga in 1777 and Yorktown in 1781, leading to peace with the Treaty of Paris in 1783, with the recognition of the United States as an independent nation bounded by British Canada on the north, Spanish Florida on the south, and the Mississippi River on the west. By 1763, Great Britain possessed a vast holding on the North American continent. In addition to the thirteen colonies, sixteen smaller colonies were ruled directly by royal governors. Victory in the Seven Years' War had given Great Britain New France (Canada), Spanish Florida, and the Native American lands east of the Mississippi River. In 1765, the colonists still considered themselves loyal subjects of the British Crown, with the same historic rights and obligations as subjects in Britain. The British government sought to tax its American possessions, primarily to help pay for its defense of North America from the French in the Seven Years' War. The problem was not that taxes were high but that they were not consulted about the new taxes, as they had no representation in parliament. The phrase "no taxation without representation" became popular within many American circles. Government officials in London argued that the Americans were represented "virtually"; but most Americans rejected the theory that men in London, who knew nothing about their needs and conditions, could represent them. In theory, Great Britain already regulated the economies of the colonies through the Navigation Acts according to the doctrines of mercantilism, which held that anything which benefited the empire (and hurt other empires) was good policy. Widespread evasion of these laws had long been tolerated. Now, through the use of open-ended search warrants (Writs of Assistance), strict enforcement became the practice. In 1761 Massachusetts lawyer James Otis argued that the writs violated the constitutional rights of the colonists. He lost the case, but John Adams later wrote, "American independence was then and there born." In 1762, Patrick Henry argued the Parson's Cause in Virginia, where the legislature had passed a law and it was vetoed by the King. Henry argued, "that a King, by disallowing Acts of this salutary nature, from being the father of his people, degenerated into a Tyrant and forfeits all right to his subjects' obedience." In 1764 Parliament enacted the Sugar Act and the Currency Act, further vexing the colonists. Protests led to a powerful new weapon, the systemic boycott of British goods. In 1765 the Stamp Act was the first direct tax ever levied by Parliament on the colonies. All newspapers, almanacs, pamphlets and official documents—even decks of playing cards—had to have the stamps. All 13 colonies protested vehemently, as popular leaders like Henry in Virginia and Otis in Massachusetts rallied the people in opposition. A secret group, the "Sons of Liberty," formed in many towns, threatening violence if anyone sold the stamps. In Boston, the Sons of Liberty burned the records of the vice-admiralty court and looted the elegant home of the chief justice, Thomas Hutchinson. Several legislatures called for united action, and nine colonies sent delegates to the Stamp Act Congress in New York City in October 1765. 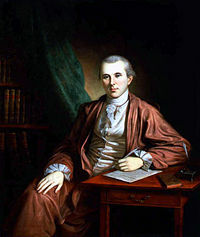 Moderates led by John Dickinson drew up a "Declaration of Rights and Grievances" stating that taxes passed without representation violated ancient rights. Lending weight to the argument was an economic boycott of British merchandise, as imports into the colonies fell from £2,250,000 in 1764 to £1,944,000 in 1765. In London, the Rockingham government came to power and Parliament debated whether to repeal the stamp tax or send an army to enforce it. Benjamin Franklin eloquently made the American case, explaining the colonies had spent heavily in manpower, money and blood in defense of the empire in a series of wars against the French and Indians, and that paying further taxes for those wars was unjust and might bring about a rebellion. Parliament agreed and repealed the tax, but in a "Declaratory Act" of March 1766 insisted that parliament retained full power to make laws for the colonies "in all cases whatsoever." In March 5, 1770, tensions escalated and five colonists (including Crispus Attucks) were killed in the Boston Massacre. The same day parliament repealed the Stamp Act, and the Declaratory Act, which asserted England's control over the colonies was enacted. This act didn't change anything because England already had full control over the colonies, so this act was ignored by the colonists. Committees of correspondence were formed in the colonies to coordinate resistance to paying the taxes. In previous years, the colonies had shown little inclination towards collective action. Prime Minister George Grenville's policies were bringing them together. John Locke's liberal ideas were very influential; his theory of the "social contract" implied the natural right of the people to overthrow their leaders, should those leaders betray the historic rights of Englishmen. Historians find little trace of Jean-Jacques Rousseau's influence among the America Revolutionaries. To write the various state and national constitutions, the Americans were influenced instead by Montesquieu's analysis of the ideally "balanced" British Constitution. The motivating force was the American embrace of a political ideology called "republicanism," which was dominant in the colonies by 1775. It was influenced greatly by the "country party" in Britain, whose critique of British government emphasized that political corruption was to be feared. The colonists associated the "court" with luxury and inherited aristocracy, which Americans increasingly condemned. Corruption was the greatest possible evil, and civic virtue required men to put civic duty ahead of their personal desires. Men had a civic duty to fight for their country. 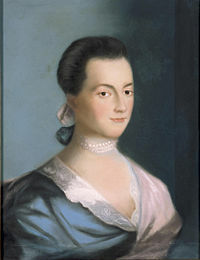 For women, "republican motherhood" became the ideal, as exemplified by Abigail Adams and Mercy Otis Warren; the first duty of the republican woman was to instill republican values in her children and to avoid luxury and ostentation. The "Founding Fathers" were strong advocates of republicanism, especially Samuel Adams, Patrick Henry, Thomas Paine, Benjamin Franklin, George Washington, Thomas Jefferson, and John Adams. The Proclamation of 1763 restricted American movement across the Appalachian Mountains. Nonetheless, groups of settlers continued to move west. The proclamation was soon modified and was no longer a hindrance to settlement, but its promulgation without consulting Americans angered the colonists. The Quebec Act of 1774 extended Quebec's boundaries to the Ohio River, shutting out the claims of the 13 colonies. By then, however, the Americans had scant regard for new laws from London—they were drilling militia and organizing for war. 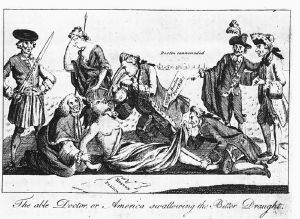 While there were many causes of the American Revolution, it was a series of specific events, or crises, that finally triggered the outbreak of war. 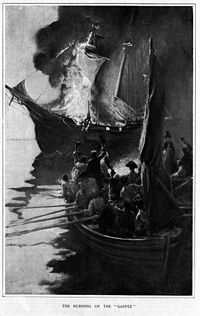 In June 1772, in what became known as the Gaspée Affair, a British warship that had been vigorously enforcing unpopular trade regulations was burned by American patriots. Soon afterwards, Governor Thomas Hutchinson of Massachusetts reported that he and the royal judges would be paid directly by London, thus bypassing the colonial legislature. In late 1772, Samuel Adams set about creating new Committees of Correspondence that would link together patriots in all thirteen colonies and eventually provide the framework for a rebel government. In early 1773, Virginia, the largest colony, set up its Committee of Correspondence, including Patrick Henry and Thomas Jefferson. The Intolerable Acts included four acts. The first was the Massachusetts Government Act, which altered the Massachusetts charter, restricting town meetings. The second act was the Administration of Justice Act, which ordered that all British soldiers to be tried were to be arraigned in Britain, not the colonies. 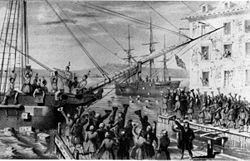 The third act was the Boston Port Act, which closed the port of Boston until the British had been compensated for the tea lost in the Boston Tea Party (the British never received such a payment). The fourth act was the Quartering Act of 1774, which compelled the residents of Boston to house British regulars sent in to control the vicinity. 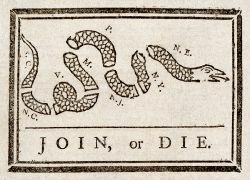 The First Continental Congress endorsed the Suffolk Resolves, which declared the Intolerable Acts to be unconstitutional, called for the people to form militias, and called for Massachusetts to form a Patriot government. In response, primarily to the Massachusetts Government Act, the people of Worcester, Massachusetts set up an armed picket line in front of the local courthouse, refusing to allow the British magistrates to enter. Similar events occurred, soon after, all across the colony. British troops were sent from England, but by the time they arrived, the entire colony of Massachusetts, with the exception of the heavily garrisoned city of Boston, had thrown off British control of local affairs. The Battle of Lexington and Concord took place April 19, 1775, when the British sent a regiment to confiscate arms and arrest revolutionaries in Concord, Massachusetts. It was the first fighting of the American Revolutionary War, and immediately the news aroused the 13 colonies to call out their militias and send troops to besiege Boston. The Battle of Bunker Hill followed on June 17, 1775. By late spring 1776, with George Washington as commander, the Americans forced the British to evacuate Boston. The patriots were in control everywhere in the 13 colonies and were ready to declare independence. While there still were many loyalists, they were no longer in control anywhere by July 1776, and all of the British Royal officials had fled. 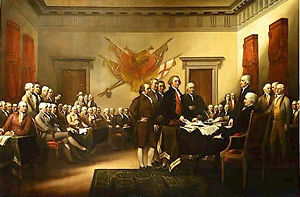 The Second Continental Congress convened in 1775, after the war had started. The Congress created the Continental Army and extended the Olive Branch Petition to the crown as an attempt at reconciliation. King George III refused to receive it, issuing instead the Proclamation of Rebellion, requiring action against the "traitors." There would be no negotiations whatsoever until 1783. The revolutionaries were called Patriots, Whigs, Congress-men, or Americans during the War. They included a full range of social and economic classes, but a unanimity regarding the need to defend the rights of Americans. After the war, political differences emerged. Patriots such as George Washington, James Madison, John Adams, Alexander Hamilton, and John Jay for example, were deeply devoted to republicanism while also eager to build a rich and powerful nation, while patriots such as Patrick Henry, Benjamin Franklin, and Thomas Jefferson represented democratic impulses and the agrarian plantation element that wanted a localized society with greater political equality. While there is no way of knowing the actual numbers, historians estimate 15 to 25 percent of the colonists remained loyal to the British Crown; these became known as “loyalists” (or “Tories,” or “King's men”). Loyalists were typically older, less willing to break with old loyalties, often connected to the Anglican church, and included many established merchants with business connections across the empire, for example Thomas Hutchinson of Boston. Recent immigrants who had not been fully Americanized were also inclined to support the king, such as recent Scottish settlers in the back country; among the more striking examples of this, see Flora Macdonald. Native Americans mostly rejected American pleas that they remain neutral. Most groups aligned themselves with the empire. There were also incentives provided by both sides that helped to secure the affiliations of regional peoples and leaders; the tribes that depended most heavily upon colonial trade tended to side with the revolutionaries, though political factors were important as well. The most prominent Native American leader siding with the loyalists was Joseph Brant of the Mohawk nation, who led frontier raids on isolated settlements in Pennsylvania and New York until an American army under John Sullivan secured New York in 1779, forcing all the loyalist Indians permanently into Canada. After the war, the great majority of loyalists remained in America and resumed normal lives. Some, such as Samuel Seabury, became prominent American leaders. A minority of about 50,000 to 75,000 Loyalists relocated to Canada, Britain or the West Indies. When the Loyalists left the South in 1783, they took about 75,000 of their slaves with them to the British West Indies. Historians, such as J. Franklin Jameson in the early twentieth century, examined the class composition of the patriot cause, looking for evidence that there was a class war inside the revolution. In the last 50 years, historians have largely abandoned that interpretation, emphasizing instead the high level of ideological unity. Just as there were rich and poor Loyalists, the patriots were a “mixed lot” with the richer and better educated more likely to become officers in the army. Ideological demands always came first: the patriots viewed independence as a means of freeing themselves from British oppression and taxation and, above all, reasserting what they considered to be their rights. Most yeomen farmers, craftsmen and small merchants joined the patriot cause as well, demanding more political equality. They were especially successful in Pennsylvania but less so in New England, where John Adams attacked Thomas Paine's Common Sense for the "absurd democratical notions" it proposed. The boycott of British goods involved the willing participation of American women; the boycotted items were largely household items such as tea and cloth. Women had to return to spinning and weaving—skills that had fallen into disuse. In 1769, the women of Boston produced 40,000 skeins of yarn, and 180 women in Middletown, Massachusetts, wove 20,522 yards of cloth. By summer 1776, the patriots had control of all the territory and population; the loyalists were powerless. All thirteen colonies had overthrown their existing governments, closing courts and driving British agents and governors from their homes. They had elected conventions and "legislatures" that existed outside of any legal framework; new constitutions were needed in each state to replace the superseded royal charters. They were states now, not colonies. The results of these initial constitutions were by no means rigidly fixed. The more populist provisions of Pennsylvania's constitution lasted only fourteen years. In 1790, conservatives gained power in the state legislature, called a new constitutional convention, and rewrote the constitution. The new constitution substantially reduced universal white-male suffrage, gave the governor veto power and patronage appointment authority, and added an upper house with substantial wealth qualifications to the unicameral legislature. Thomas Paine called it a constitution unworthy of America. The military history of the war in 1775 focused on Boston, held by the British but surrounded by militia from nearby colonies. The Congress selected George Washington as commander-in-chief, and he forced the British to evacuate the city in March 1776. At that point the patriots controlled virtually all of the 13 colonies and were ready to consider independence. 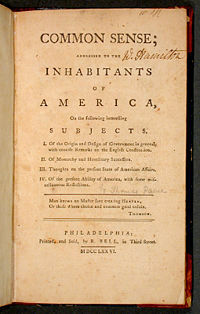 On January 10, 1776, Thomas Paine published a political pamphlet entitled Common Sense arguing that the only solution to the problems with Britain was republicanism and independence from Great Britain. On July 4, 1776, the Declaration of Independence was ratified by the Second Continental Congress. The war began in April 1775, while the declaration was issued in July 1776. Until this point, the colonies sought favorable peace terms; now all the states called for independence. The Articles of Confederation and Perpetual Union, commonly known as the Articles of Confederation, formed the first governing document of the United States of America, combining the colonies into a loose confederation of sovereign states. The Second Continental Congress adopted the articles in November 1777. The British returned in force in August 1776, engaging the fledgling Continental Army for the first time in the largest action of the Revolution in the Battle of Long Island. They eventually seized New York City and nearly captured General Washington. They made the city their main political and military base, holding it until 1783. They also held New Jersey, but in a surprise attack, Washington crossed the Delaware River into New Jersey and defeated British armies at Trenton and Princeton, thereby reviving the patriot cause and regaining New Jersey. In 1777, the British launched two uncoordinated attacks. The army based in New York City defeated Washington and captured the national capital at Philadelphia. Simultaneously, a second army invaded from Canada with the goal of cutting off New England. It was trapped and captured at Saratoga, New York, in October 1777. The victory encouraged the French to officially enter the war, as Benjamin Franklin negotiated a permanent military alliance in early 1778. Later Spain (in 1779) and the Dutch became allies of the French, leaving Britain to fight a major war alone without major allies. The American theater thus became only one front in Britain's war. Because of the alliance and the deteriorating military situation, Sir Henry Clinton, the British commander, evacuated Philadelphia to reinforce New York City. General Washington attempted to intercept the retreating column, resulting in the Battle of Monmouth Court House, the last major battle fought in the northern states. After an inconclusive engagement, the British successfully retreated to New York City. The northern war subsequently became a stalemate, as the focus of attention shifted to the southern theatre. In late December 1778, the British captured Savannah, Georgia, and started moving north into South Carolina. Northern Georgia was spared occupation during this time period, due to the Patriots victory at the Battle of Kettle Creek in Wilkes County, Georgia. The British moved on to capture Charleston, South Carolina, setting up a network of forts inland, believing the loyalists would rally to the flag. Not enough loyalists turned out, however, and the British had to fight their way north into North Carolina and Virginia, where they expected to be rescued by the British fleet. That fleet was defeated by a French fleet, however. Trapped at Yorktown, Virginia, the British surrendered their main combat army to General Washington in October 1781. Although King George III wanted to fight on, his supporters lost control of Parliament, and the war effectively ended for America. A finale naval battle was fought by Captain John Barry and his crew of the Alliance as three British warships led by the HMS Sybil tried to take the payroll of the Continental Army on March 10, 1783, off the coast of Cape Canaveral. In August 1775 the king declared Americans in arms to be traitors to the Crown. The British government at first started treating American prisoners as common criminals. They were thrown into jail and preparations were made to bring them to trial for treason. Lord Germain and Lord Sandwich were especially eager to do so. Many of the prisoners taken by the British at Bunker Hill apparently expected to be hanged, but the government declined to take the next step: treason trials and executions. There were tens of thousands of loyalists under American control who would have been at risk for treason trials of their own (by the Americans), and the British built much of their strategy around using these loyalists. After the surrender at Saratoga in 1777, there were thousands of British prisoners in American hands who were effectively hostages. Therefore no American prisoners were put on trial for treason, and although most were badly treated, eventually they were technically accorded the rights of belligerents. In 1782, by act of Parliament, they were officially recognized as prisoners of war rather than traitors. At the end of the war both sides released their prisoners. 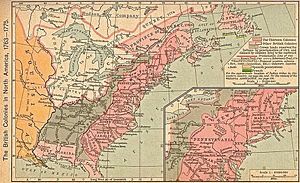 The peace treaty with Britain, known as the Treaty of Paris (1783), gave the U.S. all land east of the Mississippi River and south of the Great Lakes. The Native Americans living in this region were not a party to this treaty and did not recognize it until they were defeated militarily by the United States. Issues regarding boundaries and debts were not resolved until the Jay Treaty of 1795. For two percent of the inhabitants of the United States, defeat was followed by exile. Approximately sixty thousand of the loyalists were left the newly-founded republic, most settling in the remaining British colonies in North America, such as the Province of Quebec (concentrating in the Eastern Townships), Prince Edward Island and Nova Scotia. The new colonies of Upper Canada (now Ontario) and New Brunswick were created by Britain for their benefit. The national debt after the American Revolution fell into three categories. The first was the $11 million owed to foreigners—mostly debts to France. The second and third—roughly $24 million each—were debts owed by the national and state governments to Americans who had sold food, horses and supplies to the revolutionary forces. Congress agreed that the power and the authority of the new government would pay for the foreign debts. There were also other debts that consisted of promissory notes issued during the Revolutionary War to soldiers, merchants, and farmers who accepted these payments on the premise that the new Constitution would create a government that would pay these debts eventually. The war expenses of the individual states added up to $114,000,000, compared to $37 million by the central government. In 1790, Congress combined the state debts with the foreign and domestic debts into one national debt totaling $80 million. Everyone received face value for wartime certificates, so that the national honor would be sustained and the national credit established. The most radical impact was the sense that all men have an equal voice in government and that inherited status carried no political weight in the new republic. The rights of the people were incorporated into state constitutions. Thus came the widespread assertion of liberty, individual rights, equality and hostility toward corruption which would prove core values of republicanism to Americans. The American shift to republicanism, as well as the gradually expanding democracy, caused an upheaval of the traditional social hierarchy, and created the ethic that formed the core of American political values. The greatest challenge to the old order in Europe was the challenge to inherited political power and the democratic idea that government rests on the consent of the governed. The example of the first successful revolution against a European empire provided a model for many other colonial peoples who realized that they too could break away and become self-governing nations. The American Revolution was the first wave of the Atlantic Revolutions that took hold in the French Revolution, the Haitian Revolution, and the Latin American wars of liberation. Aftershocks reached Ireland in the 1798 rising, in the Polish-Lithuanian Commonwealth, and in the Netherlands. The Revolution had a strong, immediate impact in Great Britain, Ireland, the Netherlands, and France. Many British and Irish Whigs spoke in favor of the American cause. The Revolution was the first lesson in overthrowing an old regime for many Europeans who later were active during the era of the French Revolution, such as the Marquis de Lafayette. The American Declaration of Independence had some impact on the French Declaration of the Rights of Man and of the Citizen of 1789. By abandoning English constitutionalism and creating a new republic based on the rights of the individual, the North Americans introduced a new force in the world. Ideas spread most rapidly when they have found adequate concrete expression. Thus republicanism entered our Romantic/Germanic world.... Up to this point, the conviction had prevailed in Europe that monarchy best served the interests of the nation. Now the idea spread that the nation should govern itself. But only after a state had actually been formed on the basis of the theory of representation did the full significance of this idea become clear. All later revolutionary movements have this same goal…. This was the complete reversal of a principle. Until then, a king who ruled by the grace of God had been the center around which everything turned. Now the idea emerged that power should come from below.... These two principles are like two opposite poles, and it is the conflict between them that determines the course of the modern world. In Europe the conflict between them had not yet taken on concrete form; with the French Revolution it did. Nowhere was the influence of the American Revolution more profound than in Latin America, where American writings and the model of colonies, which actually broke free and thrived decisively, shaped their struggle for independence. Historians of Latin America have identified many links to the U.S. model. Despite its success, the North American states' new-found independence from the British Empire allowed slavery to continue in the United States until 1865, long after it was banned in all British colonies. Interpretations about the effect of the revolution vary. At one end of the spectrum is the older view that the American Revolution was not "revolutionary" at all, that it did not radically transform colonial society but simply replaced a distant government with a local one. A more recent view pioneered by historians such as Bernard Bailyn, Gordon S. Wood and Edmund Morgan is that the American Revolution was a unique and radical event that produced deep changes and had a profound impact on world affairs, based on an increasing belief in the principles of republicanism, such as peoples' natural rights, and a system of laws chosen by the people. ↑ Greene & Pole 1994, chap. 11. ↑ William S. Carpenter, "Taxation Without Representation" in Dictionary of American History, vol. 7, edited by Thomas C. Coc and Harold W. Chase (New York: Charles Scribner's Sons, 1976, ASIN B000LVZRWE). ↑ John C. Miller, Origins of the American Revolution (Boston: Little, Brown and Company, 1943). Available online. Retrieved August 15, 2007. ↑ Charles W. Toth (ed. ), Liberte, Egalite, Fraternite: The American Revolution & the European Response (Troy, NY: The Whitston Publishing Company, 1989), p. 26. Available online. Retrieved August 15, 2007. ↑ Greene & Pole 1994, chap. 9. ↑ Greene & Pole 1994, chap. 15. ↑ Greene & Pole 1994, chap. 22-24. ↑ John C. Miller, Triumph of Freedom, 1775-1783 (Boston: Little, Brown and Company, 1948), p. 87. Available online. Retrieved August 15, 2007. ↑ Robert M. Calhoon, "Loyalism and Neutrality," in Greene and Pole 1994. ↑ Gary B. Nash, The Unknown American Revolution: The Unruly Birth of Democracy and the Struggle to Create America (New York: Viking Adult, 2005, ISBN 0670034207). ↑ Greene & Pole 1994, chap. 20-22. ↑ John Phillips Resch, and Walter Sargent (eds. ), War And Society in the American Revolution: Mobilization And Home Fronts (DeKalb, IL: Northern Illinois University Press, 2006, ISBN 0875806147). ↑ Carol Berkin, Revolutionary Mothers: Women in the Struggle for America's Independence (New York: Vintage Books, 2006, ISBN 1400075327). ↑ Greene & Pole 1994, chap. 41. ↑ Allan Nevins, The American States During and After the Revolution, 1775-1789 (New York: The Macmillan Company, 1927). Available online. Retrieved August 15, 2007. ↑ Greene & Pole 1994, chap. 29. ↑ Nevins 1927; Greene & Pole 1994, chap. 29. ↑ Piers Mackesy, The War for America: 1775-1783 (Lincoln, NE: University of Nebraska Press, 1992). Available online. Retrieved August 15, 2007. ↑ Greene and Pole 1994, chap. 26. ↑ Greene and Pole 1994, chap. 27. ↑ Greene and Pole 1994, chap. 30. ↑ Don Higginbotham, The War of American Independence: Military Attitudes, Policies, and Practice, 1763-1789 (Boston: Northeastern University Press, 1983, ISBN 0930350448). ↑ Mackesy 1992; Higginbotham 1983. ↑ Claude Halstead Van Tyne, The Loyalists in the American Revolution (New York: The Macmillan Company, 1902). ↑ Merrill Jensen, The New Nation (New York: Vintage Books, 1950), p. 379. ↑ Gordon S. Wood, The Radicalism of the American Revolution (New York: Alfred A. Knopf, 1992, ISBN 0679404937). ↑ Jack P. Greene and J. R. Pole (eds. ), The Blackwell Encyclopedia of the American Revolution (Oxford: Blackwell Publishers, 1994, ISBN 1557865477), chap. 70. ↑ Robert R. Palmer, The Age of the Democratic Revolution: Vol. I: The Challenge (Princeton, NJ: Princeton University Press, 1959) (New edition, 1969, ISBN 0691005699). Available online. Retrieved August 15, 2007. ↑ Palmer 1959; Greene & Pole 1994, chap. 53-55. ↑ Palmer 1959; Greene & Pole 1994, chap. 49-52. ↑ Lynn Hunt and Jack Censer, Chapter 3 Page 1: Enlightenment and Human Rights, Liberty, Equality, Fraternity: Exploring the French Revolution, Center for History and New Media (George Mason University) and the American Social History Project (City University of New York). Retrieved August 15, 2007. ↑ Quoted in Jürgen Heideking and James A. Henretta (eds. ), Republicanism and Liberalism in America and the German States, 1750-1850 (New York: Cambridge University Press, 2002, ISBN 0521800668), p. 128. ↑ See John Lynch, "The Origins of Spanish American Independence," in Cambridge History of Latin America, vol. 3, edited by Leslie Bethell (New York: Cambridge University Press, 1985, ISBN 0521232244), pp. 45-46. ↑ Jack Greene, “The American Revolution,” The American Historical Review 105(1). Retrieved August 15, 2007. ↑ Gordon S. Wood, The American Revolution: A History (New York: Modern Library, 2002, ISBN 0679640576). Lecky, William Edward Hartpole. The American Revolution, 1763-1783. New York: D. Appleton, 1898. Available online. Retrieved August 15, 2007. Mackesy, Piers. The War for America: 1775-1783. Lincoln, NE: University of Nebraska Press, 1992. Available online. Retrieved August 15, 2007. Middlekauff, Robert. The Glorious Cause: The American Revolution, 1763-1789. New York: Oxford University Press, 1985. ISBN 0195035755. Available online. Retrieved August 15, 2007. Miller, John C. Triumph of Freedom, 1775-1783. Boston: Little, Brown and Company, 1948. Available online. Retrieved August 15, 2007. Miller, John C. Origins of the American Revolution (Boston: Little, Brown and Company, 1943). Available online. Retrieved August 15, 2007. Wrong, George M. Washington and His Comrades in Arms: A Chronicle of the War of Independence. New Haven, CT: Yale University Press, 1921. Available online. Retrieved August 15, 2007. Becker, Carl Lotus. The Declaration of Independence: A Study on the History of Political Ideas. (New York: Harcourt, Brace and Co., 1922). Available online. Retrieved August 15, 2007. Nevins, Allan. The American States During and After the Revolution, 1775-1789. New York: The Macmillan Company, 1927). Available online. Retrieved August 15, 2007. Palmer, Robert R. The Age of the Democratic Revolution: Vol. I: The Challenge. Princeton, NJ: Princeton University Press, 1959 (New edition, 1969, ISBN 0691005699). Available online. Retrieved August 15, 2007. Tansill, Charles C. (ed.). Documents Illustrative of the Formation of the Union of the American States. Washington, DC: Govt. Print. Office, 1927. Available online. Retrieved August 15, 2007. This page was last modified on 18 March 2019, at 15:19.